That’s right, 78 years ago Prohibition officially ended, and booze flowed freely again in the U.S. Of course, it hadn’t particularly stopped flowing during America’s “Noble Experiment,” and in some cases consumption actually increased, but hey, it was back to being legal. Well — and here’s one more caveat — it was legal in the sense that no Federal laws prohibited alcohol…it was mainly left to the states to decide on whether or not to enforce continued Prohibition (according to our friend Wikipedia, the last state prohibition laws weren’t eliminated until 1966). Stir with ice and strain into a rocks glass or a cocktail glass. Garnish with an orange zest and a cherry. Combine all ingredients in a saucepan over low heat, stirring until the sugar has dissolved. Allow the syrup to cool, then bottle. Keeps for a month. This cocktail is incredibly rich and boozy, perfect for December. Take advantage of the opportunity to play around with your dark, aged spirits in the Cubed OF: remember, quality spirits go in, a quality drink comes out. The demerara rum I’m using here and quite a bit of depth and molasses to the mix, the bitters holding it and the sugar in check. I do like Jamie’s later version with Mount Gay Extra Old — it emphasizes the bourbon and cognac a bit more — but as he recommends in his original post, try it out with a number of different spirits and sweeteners (he used Appleton V/X and Rittenhouse Rye in the original). I tend to go heavy on the chocolate bitters, as well, adding another dash or two. Need something to watch while sipping your Repeal Day-potable? Ken Burns provides all the info you’ll ever need on our Dry period in Prohibition. Hopefully the local public broadcasting stations are airing it today! It’s a great documentary, if you haven’t seen it already. 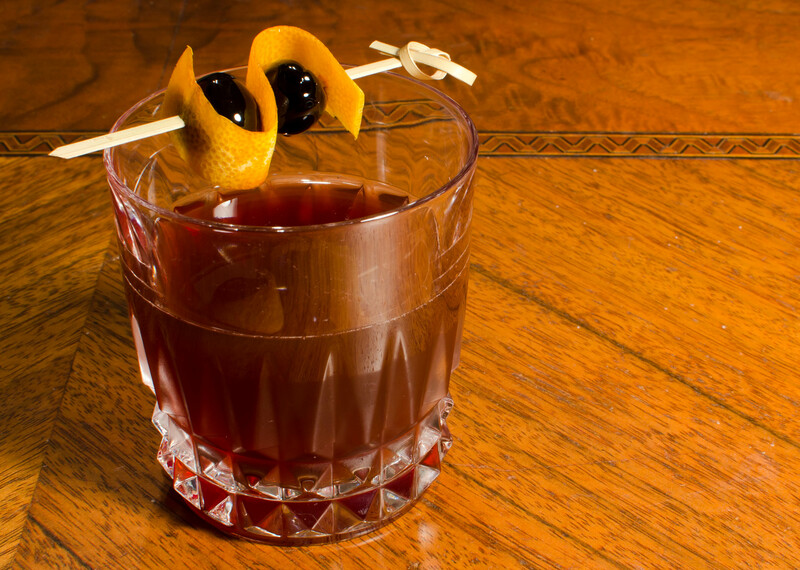 This is a tasty looking Old Fashioned! Happy Repeal Day! This entry was posted on December 5, 2011 by IJ Lauer in Angostura, Bourbon, brandy, Chocolate Bitters, cognac, Drink Recipe, Ingredient Recipe, Old Fashioned Syrup, Orange Bitters, Rum and tagged angostura, bourbon, chocolate bitters, cocktail, cognac, cubed old fashioned, drink, jamie boudreau, old fashioned syrup, orange bitters, recipe, rum.